Can Guinea Pigs Eat Dead Grass? Dead grass is that kind of grass which has been cut off from its roots and then left to die. It is often fed to many types of animals such as horses and rabbits. It is good for them to chew on. Dead grass which is left to dry turns into hay, of which there are many types of hay that available for animals to eat. Yes they can eat dead grass. They love to eat dead grass as its great for them to chew on, however they love fresh grass more as it has more of the nutrients that they need. So they can be fed either. Just a side note, my piggies have never been as keen on dead grass. They will tend to leave it until they have nothing left to chew on and then they go for it. Can Guinea Pigs Walk on Grass? One thing that guinea pigs do love to eat is grass. They will eat it all day long and it is very good for them providing it hasn’t been contaminated with chemicals. So can guinea pigs walk on grass? Yes it’s absolutely fine for them to do so. However do be careful about letting them walk on wet grass. Dampness is not good for them and will make them I’ll eventually so the best thing is to wait until its dry before you let them walk on grass. Guinea pigs enjoy walking on dry grass as it is nice for them to walk on under-foot. Can Guinea Pigs Eat Moss? Our front lawn has a big problem with moss, in fac, it’s an issue for a lot of gardens on our street. The problem with this is that when we put our guinea pigs out to run about in the lawn. We know that they can eat the grass, but what about the moss? Is it ok for them to eat, and will it harm them? Well, the good news is that moss won’t hurt them if they happen to eat it. Experience says that they will probably turn their noses up at it and ignore it as it really isn’t to their taste buds. But if they happen to eat it, it should be fine. Also, if you give your guinea pigs grass and it happens to have moss in it then they will distinguish it from the grass and separate them out. Should Guinea Pigs Eat Grass? Guinea pigs are herbivores and do they will eat any kind of plant material. They are anatomically and physiologically adapted to doing so and need this type of food in their diets at all times. Because of the way their teeth are they constantly need foliage to tiring their teeth on as is typical of a herbivorous animal. They love chewing and grinding hay, grass, tree bark, branches. Basically anything like that that is tough to break down. Their teeth grow constantly and this teeth grinding action helps to grind down their teeth. This is why although guinea pigs should have hay as their first choice, grass is is very good for them. Not only does it help with the teeth grinding, it also contains many great nutrients that are of great benefit to them. Grass contains high amounts of vitamins a, c and d as well as being high in fibre which is great for them and is best given to piggies when it is hand picked, fresh and dry. 1. Know where you are getting it from? Do you know what has gone on that grass before you picked it? Often grass picked from public places has had all matter of feet on it, animals doing their stuff on it, litter dropped on it. So be we are that the grass that you pick from an area may not be as pure as you think it is. If you are fortunate to have a lawn at your home, then that’s the best thing for your guinea pigs. Of course it’s your prerogative, but just take care when picking grass from public areas. However with having your lawn comes the whole thing of lawn mower oil or petrol dropping on your lawn if you have a petrol mower. Such chemicals are not good for your piggies at all so do be aware of this before you pick grass from your yard. 3. 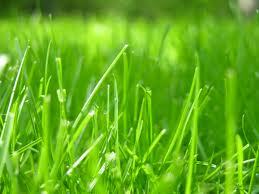 Also be aware of grass picked from the roadside which has been infected with exhaust fumes. Grass from verges beside roads will have exhaust fumes in it which will also not be good for piggies at all. The RSPCA say not to feed your guinea pigs lawnmower clippings as they are likely to make your guinea pigs ill. The fermentation process that the clippings go through changes the nutrients in the grass and can cause bloat for guinea pigs. Has a lot of calcium in it, as well as a lot of vitamin c. So not too much of it. 6. It should be free of any kind of mould. Mould can be extremely bad for guinea pigs if digested and if grass that is mouldy is given to them then it can cause all kinds of problems. If you are going to pick grass and then store it, it is best not to store damp grass or indeed keep it for too long as it can get mouldy if this is the case. Can Guinea Pigs Eat Grass? Grass is one of the first foods that guinea pigs usually go for as it is always available. It is great for them to graze on and nibble all day long. One of the first things that I noted when we first got our guinea pig was how much he loved eating it, and often preferred it to other foods that we gave him. It is very good for them and helps them grind their teeth because of the abrasive nature of grass. Can guinea pigs eat too much grass? There is no problem with guinea pigs eating too much grass. It wont do them any harm, just make sure it hasn’t been treated with chemicals or pesticides. What do I need to watch out for with when giving grass to my guinea pig? Too much rich spring grass can cause a little trouble for their tummies if they are not used to it. After winter time, ease them in to the spring grass gently. Don’t let them have too much too soon introducing a bit a day to them so they don’t consume too much too soon. 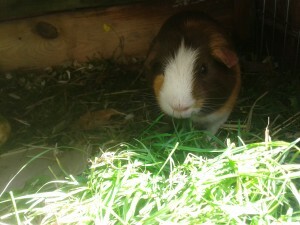 A good article for reintroducing guinea pigs to grass is here. Can I grow grass for my guinea pigs? If you don’t have easy access to a garden with grass then this is definitely something that is possible. Get some trays and compost and plant some grass seeds ready for them to grow. If you are looking for the best grasses to grow for your guinea pig, then wheat grass or catgrass is a good place to start. Wheat grass is a little healthier for your guinea pigs. You can also buy grass from garden centres which has been ready grown that you can use. Or, you can always pick some up from public areas where you can. Can guinea pigs eat wet grass? If its in summer then there isn’t a problem at all. Do be careful though when putting your guiena pigs on wet grass as you don’t want your piggies to be damp. Can guinea pigs eat grass clippings? You need to watch out if you have a petrol mower for any chemicals that have leaked out onto it. But there is no harm in them eating freshly mown grass. My guinea pig doesn’t go for dried out grass though. Can guinea pigs eat grass instead of hay? Although there is no problem with guinea pigs eating grass, a guinea pig’s staple diet should include timothy hay, but if you only give them grass every so often there’s nothing wrong in that. Can guinea pigs eat grass and clover? Yes there is no problem with this. They should love grazing on grass and clover. Just make sure it isn’t on an area which has been fertilized. Can guinea pigs eat grass and dandelions? Yes that should be fine for them to eat. My guinea pig has a selective taste for weeds but your guinea pig may be different. Can guinea pigs eat grass seed? Grass seed is fine as a treat however don’t let them have too much of it. Can Guinea Pigs and Rabbits Live Together? You would think that would work ok. I did! Guinea pigs are very social animals and it is preferable that they have some company in their home. Rabbits have a similar type of living space and they’re a similar size, you would think that they were a good fit to share a living space with a Guinea Pig. But digging deeper I began to discover that having them both together sharing the same space is actually something to be avoided. What I discovered was that it is not a great idea to put Guinea pigs and rabbits together and there are five reasons for this. 1. Rabbits and Guinea Pigs have different dietary requirements. Although both species feed on copious amounts of hay and vegetables, they require different diets as the rabbit does not need a regular supplement of vitamin C and so the food it eats will be different. However there are better reasons why its not a good idea as it doesn’t matter a great deal if they share the same food. Because a rabbit tends to be bigger than your average guinea pig, it can easily hurt the cavy especially with its powerful hind legs. This can especially happen if the rabbit is bouncing around the cage or is startled by something. There are also types of rabbit that will try and bite a guinea pig such as a doe rabbit. Whether or not they mean to do it or not, this is something to definitely be avoided. Rabbits are very good at burrowing and will very easily burrow out of a grid or run that is placed on grass. The guinea pig, if it lives with the rabbit will easily follow. This is a small risk but one that needs to be considered all the same. The behaviour of rabbits and guinea pigs are very different and they will communicate in different ways and not understand each other. When this happens it causes a lot of stress for both creatures and potential conflict. Rabbits can carry the disease Bordetella bronchiseptica which is the biggest cause of respiratory disease in guinea pigs. (source; RSPCA). Some things to be aware of if you do have Rabbits and Guinea Pigs together. If a guinea pig and rabbit are living together then do ensure that the guinea pig has access to a retreat where they can get away from the rabbit. This should be somewhere where the rabbit cannot access. Make sure that the rabbit is neutered so the guinea pig is not mounted by the rabbit. Make sure they are fed differently and in different areas. If you can help it and for the sake of both animals, it is usually better to keep them apart. However, there are always exceptions to this rule and if you feel that this could work then that is your discretion but the overwhelming evidence is that this is not a good mix. Have you had any experiences of having Rabbits and Guinea Pigs live together? Positive or Negative.